Hot hatches by their very nature aren’t necessarily everybody’s cup of tea. Some are loud, brash and in your face. Don’t get me wrong, this is what sets them apart from their tamed standard siblings but sometimes subtlety can have its own benefits which covers the other side of the hot hatch models. 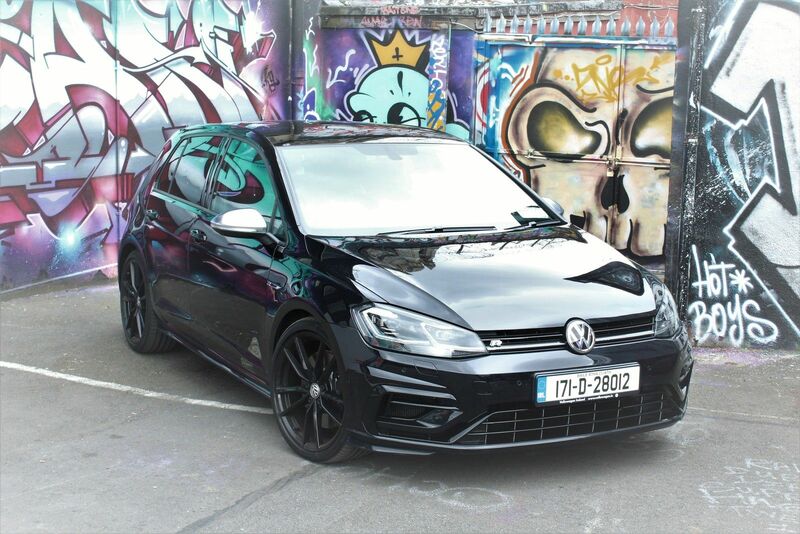 The Volkswagen Golf R sits nicely into the latter end of this hot hatch market with its subtle appearance but excellent driving ability that will leave a smile on your face all day long. It isn’t enough that Volkswagen already have the Golf GTi to satisfy the performance junkies amongst us. The Golf R adds another 80 bhp and all wheel drive giving us a hot hatch that takes its place at the top of the Golf range. The new Volkswagen Golf R, as with the rest of the Golf range received a refresh earlier this year. During that the Golf R received additional engine power output bringing it up to an impressive 310hp as well as some subtle exterior updates. The Golf R now receives a new bumper and light arrangement while the headlamps are now LED as are the tail lights. There also appears to be some sharing of technology between Volkswagen and their motoring family as the rear light cluster has inherited the running indicators which we have seen in several Audi models. 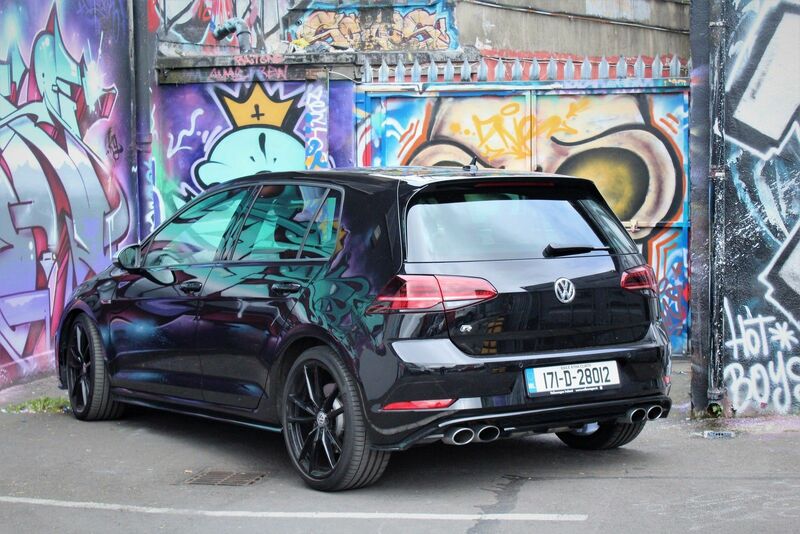 One of the biggest give-aways that the new Golf R is more than just your standard Golf are the four gleaming exhaust tailpipes taking pride of place in below the rear bumper. Inside the Golf R has also benefited from the same makeover as we see the inclusion of the new virtual cockpit TFT dials which are specifically designed for the R with the speedo reaching an eye watering 320 km/hr as well as the brilliant new 8-inch clear glass touchscreen infotainment system. 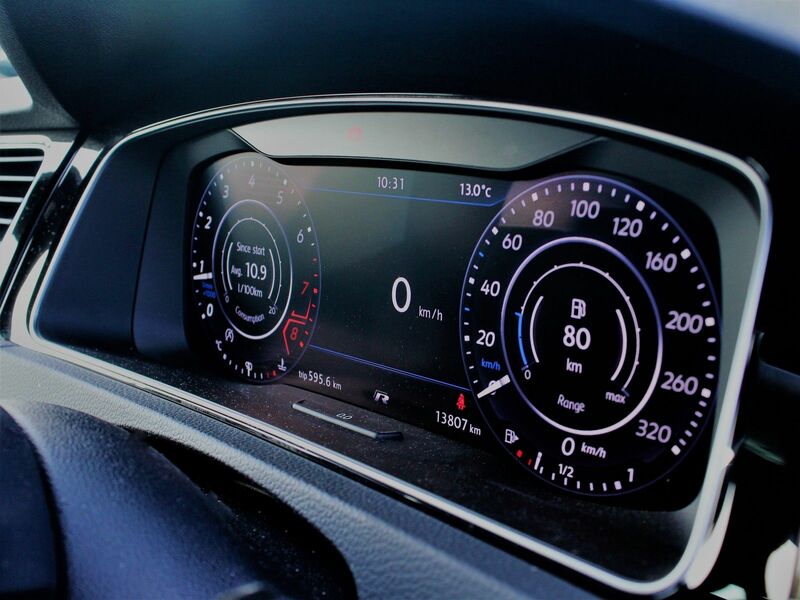 The inclusion of this new clear glass touchscreen brings the interior tech levels of the new golf to a different level when compared to its competitors. 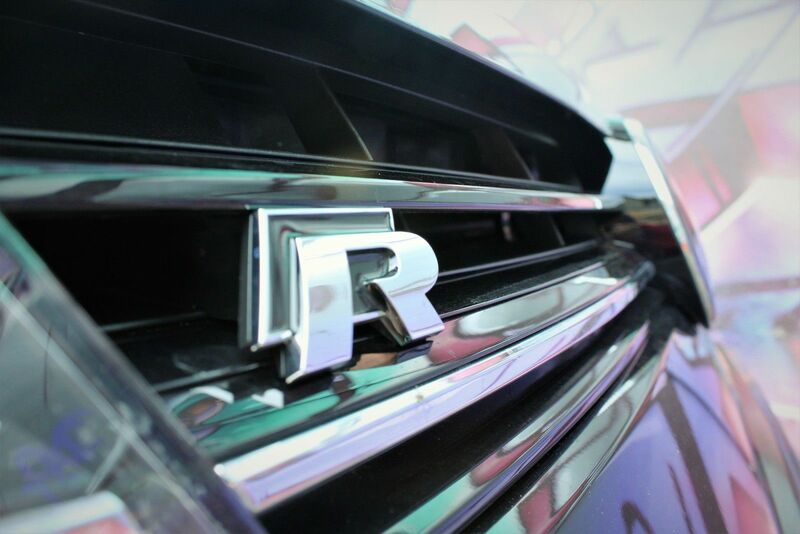 The interior also benefits from the “R” branded alcantara and leather sports seats which offer a superior level of comfort and support. The R specific sporty multifunction steering wheel and well-designed switchgear leave you in no doubt that the interior of the new Golf R has been finished to the highest standard while the tech spec also includes Bluetooth, front and rear parking sensors, adaptive cruise control as well as “Front Assist” with pedestrian monitoring system, to name but a few. The driving position is bang-on too with plenty of steering wheel and seat adjustment available. Interior space is as per any other Golf, respectable and comfortable with ample stowage space throughout the cabin. The addition of the drive tunnel through the centre of the floor does reduce leg room for the middle rear seat passenger however. Boot space is also slightly reduced to 343 litres to accommodate the 4Motion rear differential and other hardware however this is still respectable within the hot hatch segment. So, that’s enough about the new exterior looks and interior finishes. The big question is what is it like on the road. Put simply it is a genuinely quick car with an ability of feeling totally secure whilst letting you push it to within an inch of limit as it works out the best way to extract the most amount of pace from any given input on any given road. 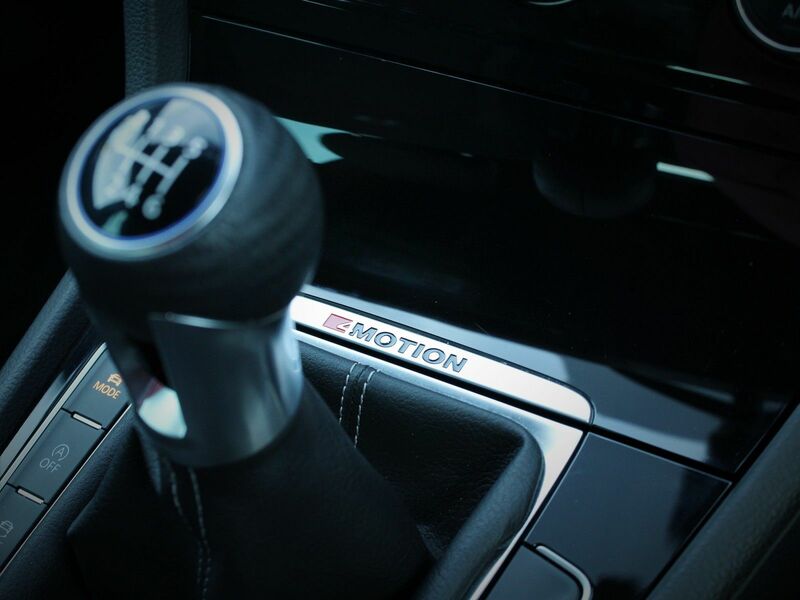 As you push the Golf R on you become very aware of the speedy response of the steering which is perfectly weighted and the cars ability to respond to even the slightest throttle input. The four-wheel drive system ensures that where front wheel drive hot hatches can sometimes become a tug of war when being pushed through tighter bends, the Golf R responds instantly and has the traction to back it up. You get a great sense that the chassis really wants to work with you and the Golf R seems to perform better the harder its pushed. The addition of the driver profile selection allows you to toggle between differing drive modes with “RACE” mode being the mode of choice over the course of my test week. When compared with its closest competition the Golf R stacks up well against the likes of the Ford Focus RS and the new Honda Civic Type R and comes in a few thousand euro cheaper too even with the optional extras on my test model. While both the Focus RS and Civic Type R fall into the loud and head turning end of the hot hatch market the Golf R settles nicely into the subtle end all the while knowing that that what is under the bonnet and indeed extended to each corner is perfectly capable of putting it up to even the best of its competitors. 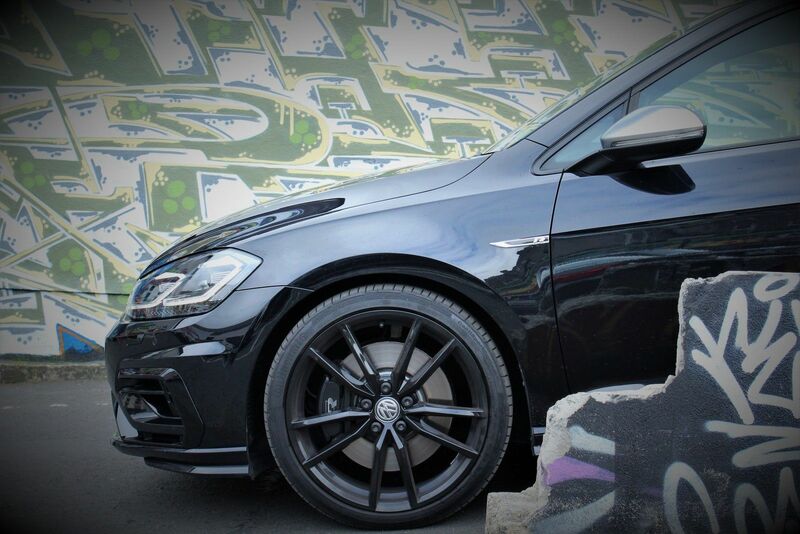 Power delivery is seamless while the Golf R is as surefooted as a mountain goat.